Once you get an idea, draw it / write it down with the date besides it. Set an alarm for exactly three years later. If you still want it, you can get it done. 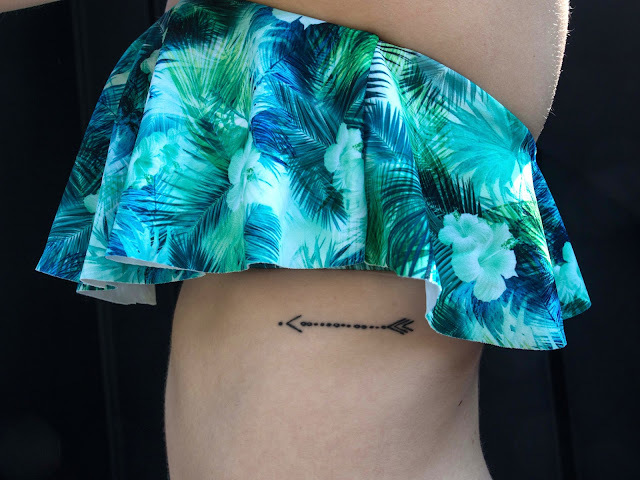 So, three years ago in March, I wrote down an idea for an arrow tattoo. The final idea came along late last year, but the arrow stayed the same. This year, I am turning the big 25. I wanted a tattoo that represented the past 25 years in a quite abstract manner. The idea behind the tattoo is that that there is a little dot per 2 years of my life. Each big dot marks an important event, whether it be positive or negative. For example, I have a dot for when my parents got divorced, one for when I met my best friend and one for when I met my BF. I also liked the idea of it being quite static, just a series of lines and dots, nothing too much. There is also a bigger dot at the end of the arrow, signifying positive things in the future. I got it done on my left rib cage, just below where my bra line ends. I wanted it to be visible to me, but not to everyone else; you can see it when I'm in a bikini, but in a holiday state-of-mind it doesn't bother me. Rib-cage tattoos are supposed to hurt, but because mine is so small and without any 'shading' to be done, it didn't hurt at all and was done after 3 minutes. The fact that I got it done in March was also great, because it won't see any sun until summer so it can heal properly. I absolutely love where my little tattoo stands for. And it's totally true what they say, once you get one, it will take you less long until you get another one. I already have an idea I'm toying with, but that's for another time! What's your idea of tattoos? Love or hate? I'm curious to know.